Why do we need a Pathmaker? Why this position at this time? Ecology Ottawa is a not-for-profit, grassroots and volunteer-driven organization working to make Ottawa the green capital of Canada. We have been working on sustainable transportation for five years through advocacy on issues like complete streets, light rail, bike lanes, street design, accessibility and funding for cycling and pedestrian infrastructure. We’re at a crossroads as a city. Across Ottawa, there isn’t a single full-time person dedicated to complete streets and sustainable transportation. This comes at a time of profound change in the urban fabric of Ottawa. The city is gearing up for Canada’s 150th birthday, implementing light rail in stations across the city, revitalizing the LeBreton Flats area and starting to implement a complete streets policy that could turn out to be one of the most innovative and ambitious in North America. In short, it’s a time of great challenge and great opportunity. As advocates, we know that all decision-makers – whether they are passionate about cycling or more reticent to implement changes to the status quo – must respond to their constituents if they hope to keep their jobs. It’s our task to mobilize and help organize the residents of Ottawa who care about the environment, so that decision-makers can hear from this passionate sub-section of the electorate when making decisions. Doing this takes people power – not only the power of a mobilized constituency who care about the environment, but the power of paid staff who understand the issues and can work to organize the community around a positive environmental vision. Individual donations are the most effective way to make this happen. They are critical to the success of any advocacy organization because they allow us to remain completely independent and responsive to the needs of the concerned, environmentally-conscious public. At peak capacity, Ecology Ottawa works in three areas. Our Living City campaign is dedicated to improving Ottawa’s greenspace, tree cover and natural environment. Our Renewable City campaign is dedicated to promoting the rapid transition to renewable energy and stopping the proposed Energy East pipeline. Our Active City campaign is dedicated to sustainable transportation. Currently, this campaign seeks to increase provincial and federal funding for cycling and pedestrian infrastructure, promote cycling and walkable communities, and implement the City’s new Complete Streets Policy. We know that transportation decisions are critical to the health, vitality and viability of our communities and environment. For decades, North American cities were designed with the principal aim of getting cars to and from different points as quickly as possible. This has resulted in isolated communities, a loss of precious greenspace, growing levels of congestion and air pollution, lower levels of physical activity, funding challenges for public transportation, and threats to safety and accessibility for pedestrians and cyclists. It has also contributed to the climate crisis by privileging car transportation in the day-to-day travel decisions of every resident of the city. Bad transportation choices can constrain a city’s options and lead to long term problems. The more we design sprawling car-centric communities, the more we make transit unaffordable and walking or cycling unsafe. Because people are more reticent to use active transportation when the options at their disposal are dangerous or inconvenient, congestion levels continue to rise as people stick to their cars. New roads and new lanes are touted as a possible solution to the congestion, but if these are designed primarily for cars, they can worsen the problem they were intended to solve. The new roads are quickly filled up by cars and other modes of transit continue to be inaccessible. In the end, we’re stuck with more cars and more demand for car infrastructure than when we started. The Active City is about forging a new path forward. It’s about working with what Ottawa already has – a city-wide network of bike paths, a robust transit system, and strong communities with access to amenities and greenspace – and pushing for lasting improvements to our city. It’s about revitalizing our communities by making them safer and more practical for people of all ages to live and play in. It’s about giving people the freedom to choose transportation options that nourish their physical and mental health while enhancing the vibrancy of community life. And it’s about simultaneously taking action on the issues of climate change, pollution and greenspace protection through a positive and concrete changes. Ecology Ottawa’s Active City campaign builds on the political momentum we’ve seen in recent years at City Hall. In 2013, the City of Ottawa adopted a Complete Streets Policy, and then followed this up with an implementation framework in 2015. Essentially, the City has agreed to look at street construction and reconstruction through a ‘complete streets’ lens – rather than seeing roads as throughways for personal automobiles, city engineers will ensure they are designed for all users, ages and abilities. Our task is to ensure that the new policy is widely and thoroughly implemented. We know there are hundreds of streets across the city that will come up for construction or renewal over the next few years. By working with the communities at the centre of these changes, we can mobilize residents of the city to push for meaningful and lasting improvements to their neighbourhoods at opportune moments. In April 2016, Ecology Ottawa launched the Complete Streets Map project. This is an interactive tool designed to help residents across the city find streets slated for renewal in their neighbourhoods, and then take a leadership role in overseeing that these streets are re-built as complete streets. The City of Ottawa is also in the midst of building a comprehensive light rail transit (LRT) network which would dramatically scale up the city’s public transportation capacity while reducing greenhouse gas emissions from buses and cars. Phase 1 of the plan, scheduled for completion in 2018, is currently under construction. Phase 2 would extend LRT to the western, eastern and southern ends of the city by 2023. While it looks like LRT is going ahead, there are lingering questions about ensuring adequate cycling and pedestrian connectivity at the new LRT stations popping up all across the city. We recently discovered that the City essentially forgot to add bike lanes to the new Booth Street station – a critical link to and from LeBreton Flats, Zibi, and Gatineau. We must ensure that similar mistakes are avoided as the city rolls out its new transit network. More broadly, we must monitor the City and press it to make good on its promises to promote transit-oriented development through planning that prioritizes cycling and pedestrian access in the vicinity of transit stations. The City has also committed to two plans which could make active transportation safer and more convenient. The Cycling Infrastructure Plan and the Pedestrian Infrastructure Plan could have a transformative impact on the city and leave a lasting legacy for current and future generations. However, their funding is currently spread out and delayed over 15 years. Additional funding could accelerate investments in infrastructure such as bike lanes, walkways, signage, pedestrian bridges and transit integration measures. There is evidence that the federal government could help out with funding in this area, but we need leadership from City Hall – a list of shovel-ready projects along with seed funding – if we hope to take advantage of this funding opportunity. Ecology Ottawa has been at the forefront of environmental advocacy in Ottawa for nine years, and has been actively working on sustainable transportation for five years. 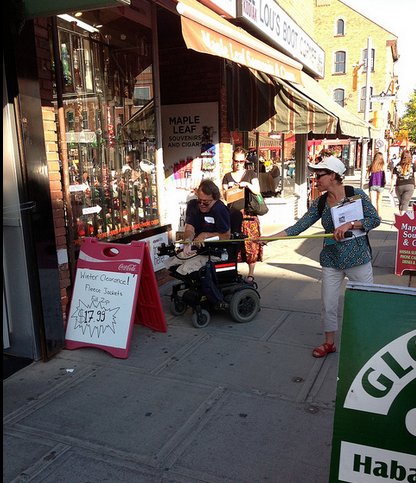 Now is the time to bring transformative change to Ottawa’s streetscape. By becoming a Trailblazer, you’ll be joining a community of like-minded Ottawa residents who have agreed to step up and make a lasting difference for their city. You can become a Pathmaker by clicking here. If you have any further questions, please don’t hesitate to contact Robb Barnes directly at robb.barnes@ecologyottawa.ca or 613-276-5753.